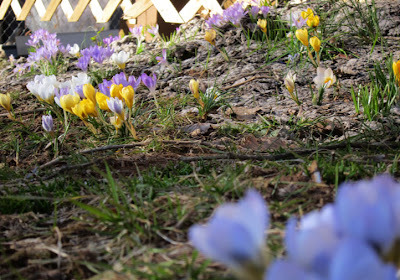 Crocus were just the first salvo in Primavera's surprise conquest of my backyard--and my heart! I confess to a raging crush on Springtime. When Zephyrus blows the pollen around and the three Graces start dancing in my yard, I just want to run out and join their frolicking. Bulbs are coming up all over the place, some that I planted, some cached and forgotten by squirrels, and many busting out from under the leaves with purely voluntary enthusiasm. I want to roll around among the crocus and the daffodils and lose myself Emily-Dickenson-style in the living hummus and the perfume and the warm sun. This is the reason I moved to Virginia. I can throw open my window on a March morning and smell Life bursting from the ground. I can see the Earth sending its woody tendrils toward the sky. I can wear the same thing outside and in. Just a few degrees warmer than New York brings this rapture a full month sooner. I definitely wouldn’t roll on the ground there. Sadly, as I write this, that’s exactly where I’m headed: northbound on the Regional and I’m watching the gorgeous Piedmont roll by—and away. I won’t be able to welcome the Equinox as I had hoped on the porch of a cabin in the woods by a lake. Equinox means something different in the City and my rites will have to wait. First a short exile and I will be very glad to see my friends. Sprintime has undeniable charms there but throughout the sojourn I will be thinking about the trees in bud and the many green shoots in my garden. Soon I’ll be back and Primavera will be there and although she won’t wait for me, she will welcome me back to her embrace without reservation.